How ecosystems develop means of retaining soluble organic nutrients during primary succession and soil development, denitrification, fate of organic nitogen inputs in the Truckee River, phosphorus input and cycling in Lake Tahoe, control of phosphorus eutrophication by addition of ferric chloride and alum, the process of humification and the control of carbon sequestration in soil, soil nitrogen and carbon mineralization in the Mojave desert, microbial decomposition of dissolved humic substances, ecophysiology and competitive relationships of Lepidium latifolium (tall whitetop) and other invasive wetland plants. Wetland Ecology and Management: NRES 440/640. 4 credits. Geomorphology, hydrology, soils, biogeochemistry, physiology of wetland organisms, wildlife management, restoration, mitigation, and law of wetlands. Laboratory required. For upper level undergraduates and graduates. Microbial Ecology: NRES 777. 4 credits. Topics include: the origin of life, microbial evolution, biochemistry and cell structure of Archaea, Bacteria, algae, classification, algal ecology, methods, plant-microbe interactions, soil and water environments, biodegradation. 4 credits includes required Lab. For graduate students. “Pioneer of Disinfection Award”: Awarded jointly by International Water Association the Water Environment Association, the, and the American Water Works Association, Feb. 2007. All American Award, USA Track and Field, Masters Division, 1500 m, 1 mile, 3000 m, 10,000 m. runs in 2006 and 2007. Uselman, S. M., Qualls, R. G., Lilienfein, J. 2012, Quality of Soluble Organic C, N, and P Produced by Different Types and Species of Litter: Root Litter versus Leaf Litter, Soil Biology and Biochemistry, 54, 57-67. Qualls, R. G., Sherwood *(advisee), L. J., Richardson, C. J. 2009, Effect of natural dissolved organic carbon on phosphate removal by ferric chloride and aluminum sulfate treatment of water in wetlands., Water Resources Research, 45, 9414-9423. Vandenbruwane*, J., De Neve, J. S., Qualls, R. G., Hoffmann, G. 2007, Comparison of different isotherm models for dissolved organic carbon (DOC) and nitrogen (DON) sorption to mineral soil., Geoderma:139: 144-153. Uselman, S. M., Qualls, R. G., Lilienfein 2007, Contribution of Root- vs. Leaf-Litter to Dissolved Organic Carbon Leaching through Soil., Soil Science Society of America Journal 71:1555-1563. Uselman, S. M., Qualls, R. G., Lilienfein*, J. 2007, Fine root production across a primary ecosystem chronosequence at Mt. Shasta, California., Ecosystems 10: 703-717. Saito, L., Miller, W. W., Johnson, D. W., Qualls, R. G., Provencher, L., Carroll, E., Szameitat, P. 2007, Fire effects on stable isotopes in a Sierran forested watershed., Journal of Environmental Quality 36: 91-100. Carroll EM, Miller WW, Johnson DW, Saito L, Qualls RG, Walker RF. 2007, Spatial analysis of a large magnitude erosion event following a Sierran wildfire., Journal of Environmental Quality: 36: 1105-1111. Nadeau, J., Qualls, R. G., Nowak, R. S., Blank, R. R. 2007, The potential bioavailabiltiy of organic C, N, and P through enzyme hydrolysis in soils of the Mojave Desert., Biogeochemistry: 82:305-320. Lindberg S.E., Dong, W., J. Chanton, R.G. Qualls, and T. Meyers. 2005, A mechanism for bimodal emission of gaseous mercury from aquatic macrophytes in the Everglades., Atmospheric Environment 1289-1301. Qualls R.G. 2005, Biodegradability of fractions of dissolved organic carbon leached from decomposing leaf litter., Environmental Science and Technology 39: 1616-1622. Chen*, H, Qualls R.G., and Blank R.R. 2005, Effect of soil flooding on photosynthesis, carbohydrate partitioning, and nutrient uptake in the invasive exotic Lepidium latifolium., Aquatic Botany 82: 250-268. Qualls, R.G and Bridgham, S.D. 2005, Mineralization rate of 14C labeled dissolved organic carbon in soils from a weathering chronosequence., Soil Biology and Biochemistry 37:905-916. Qualls, R. G., Haines, B. L., Swank, W. T. 2014, Long-Term Response of a Forest Watershed Ecosystem: Commercial Clearcutting in the Southern Appalachians, W. T. Swank and J.R. Webster (Ed. ), Chapter 5. Soluble organic nutrients (pp. 85-101). New York: Oxford University Press. Qualls, R. G. 2013, Methods in Biogeochemistry of Wetlands., In R. D. DeLaune, K.R. Reddy, C.J. Richardson, and J.P. Macgonigal, (Ed. ), Chapter 16: Dissolved Organic Matter (pp. 317-330). Madison, WI: Soil Science Society of America, Book Series.. There are several difficulties that may be encountered in characterization of dissolved organic matter in wetlands. 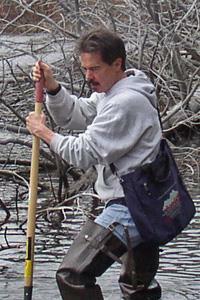 The high concentration of DOM in most wetlands assure that concentrations are usually well within the range that is analytically detectible. However, in cases where NH3 and NO3 are much higher than concentrations of DON, the accuracy of DON determinations is severely affected since the concentration is a calculation of difference in three analyses. Vandenbruwane et al. (2007) discuss several methods to increase the accuracy of DON determinations in the presence of high inorganic N concentrations. Given that wetlands are recognized for their high export of DOC, DON, and DOP, we might consider that a minimum characterization of DOM in wetland waters should include elemental analysis of the DOM, including DOC, DON, DOP and perhaps other organically associated elements (e.g. Fe). Going further in characterization, perhaps the most important properties are based on assays of biodegradability and dominant physiochemical properties. Because of the complex macromolecular properties and the diversity of molecules, further characterization methods are focused on the abundance of certain functional groups or distribution of molecular masses. Beyond the methods listed in Table 2, a more thorough, but difficult, characterization might include 13C solid state nuclear magnetic resonance for structural group information (Wershaw et al., 2000), or atmospheric pressure photoionization high-field Fourier-transform ion cyclotron resonance mass spectrometry (to estimate the range of molecular masses and formulas). These methods require highly specialized equipment. In all these methods, it must be recognized that macromolecules may have a number of structural or functional groups that may or may not dominate the behavior of the molecule or the accessibility to microbial enzymes. Qualls, R. G., Haines, B. L., Swank, W. T. 2010, Soluble organic nutrients., In W. T. Swank and J.R. Webster (Ed. ), Response of a Forest Watershed Ecosystem: Commercial Clearcutting in the Southern Appalachians (pp. 129-145). Richardson, C. J., King, R. S., Qian, S. S., Vaithiyanathan, P., Qualls, R. G., Stowe, C. A. 2008, An ecological basis for establishment of a phosphorus threshold for the Everglades ecosystem., Chapter 25. In C.J. Richardson (Ed. ), The Everglades Experiments: Lessons for Ecosystem Restoration (pp. 658-679). NY: Springer. Qualls, R. G., Richardson, C. J. 2008, Carbon cycling and dissolved organic matter export in the northern Everglades., Chapter 13. In C.J. Richardson (Ed. ), The Everglades Experiments: Lessons for Ecosystem Restoration (pp. 335-379). Springer, New York. Richardson, C. J., Pahl, J. W., Vymazal, J., Vaithiyanathan, P., Qualls, R. G., Sundareshwar, P. V., Barber, L., Johnson, J. 2008, Enrichment gradients in WCA-2A and Northern WCA-3A: Water, soil, plant biomass, and nutrient storage responses., Chapter 6. In C.J. Richardson (Ed. ), The Everglades Experiments: Lessons for Ecosystem Restoration (pp. 79-137). Springer, New York. Richardson, C. J., Qualls, R. G., Vymazal, J., Vaithiyanathan, P., Zahina, J. G. 2008, Macrophyte slough community response to experimental phosphorus enrichment and periphyton removal., Chapter 16. In C.J. Richardson (Ed. ), The Everglades Experiments: Lessons for Ecosystem Restoration (pp. 401-444). Springer, New York. Richardson, C. J., Qualls, R. G., Vaithiyanathan, P., Bush, M. B., Stow, C. A., Ho, M. Water quality, soil chemistry, and ecosystem responses to P dosing. 2008, Water quality, soil chemistry, and ecosystem responses to P dosing., Chapter 15. In C.J. Richardson (Ed. ), The Everglades Experiments: Lessons for Ecosystem Restoration (pp. 383-400). Qualls, R. G. 2010, Bioavailability of Dissolved Organic Nitrogen Originating From Natural Sources and Wastewater Effluent in the Truckee River, Final Report to the Community Foundation of Western Nevada. Large scale Free Air Carbon Enrichment experiments have shown that generally there is a substantial increase in forest tree productivity when trees are exposed to elevated atmospheric CO2. It is often assumed that this increase in productivity will result in increased C storage in the soil, thus partially mitigating the rise in atmospheric CO2. We measured C mineralization rates in soils taken from forest plots exposed to either: ambient conditions, elevated CO2, elevated ozone, or elevated CO2 plus ozone for 12 years. Soils were incubated for one year and the rate of C mineralization was measured. The percentage of soil C mineralized during the incubation was significantly greater in soils from CO2 enriched plots compared to ambient plots but the difference was only 13% in the 0-10 cm depth of soil and 25% in the 10-20 cm depth. The greater percentage of soil C respired in one year was probably not enough to account for the fate of the increased production in the CO2 enriched plots. A substantial amount of C from the CO2 enrichment remained in the refractory fraction of soil C.